Back in the days when they were in high school and when the Blue Devils ruled supreme in things basketball, Lovell "Cowboy" Underwood and Jimmy McFarland were noted the length and breadth of Kentucky for their "eagle eyes" and the fans were disappointed if the pair did not make a half a dozen brilliant shots apiece. For two months this pair, now the forwards of the University of Kentucky quintet, having been striving to regain their "eyes." The Wildcats were only kept in the running by wonderful floor work and the teamwork they had mastered under Clarence Applegran's tutelage. Last night at the university gym, the Wildcats' were off in their teamwork but the Underwood and McFarland of old were present and doing their stuff, and Kentucky defeated Washington and Lee by a score of 28 to 22. It was one of the best games of the season. 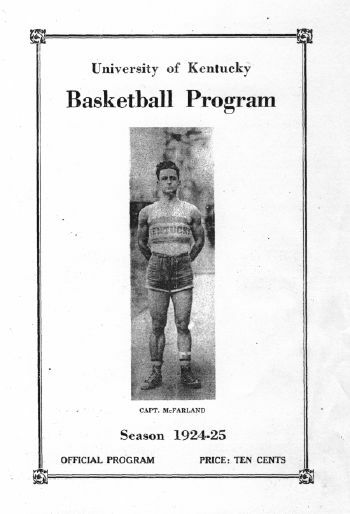 Captain McFarland scored six field goals and one foul out of one try for a total of 13 points, while Underwood sent the ball through the hoop five times from the floor and batted 1.000 with two foul throws. The majority of the field goals were made from beyond the foul line and from difficult angles, often when rushed by an opposing player. The game would have been a fitting climax had the score been tied when the closing gun was sounded. McFarland shot from near the center circle. It was a high looping effort and just as the ball had reached the peak of its arch, the gun was discharged by the timer. Jimmy's aim was true and the ball railed through the hoop, giving the Wildcats two more points. The first half of the game was exceedingly close with the score see-sawing, but the end of the period found the Wildcats leading 12 to 10. Kentucky increased the margin at the start of the second half and although the Generals made several spurts, they never tied the score or forged ahead of the Blue and White again. Washington and Lee's players were all faster than the Wildcats, which seems astounding. Everyone one of them was an exceptional dribbler and their method of offense was a dribble down the center of the floor with other members of the team keeping pace down each foul line. However, they could not penetrate consistently the territory around the foul ring with Burgess Carey getting in the way. Fumbling was all too frequent among the Wildcats and this slowed the Kentucky teamwork to a great degree. Several times the Wildcats appeared to be working smoothly when one of them muffed the ball and spoiled everything. They also had to encounter a stubborn defense by the Generals as the territory in front of their own goal was well populated with the blue and gray checkered jerseys of the Generals. Captain Lane did the best work for Washington and Lee and his dribbling struck fear into the Wildcats.